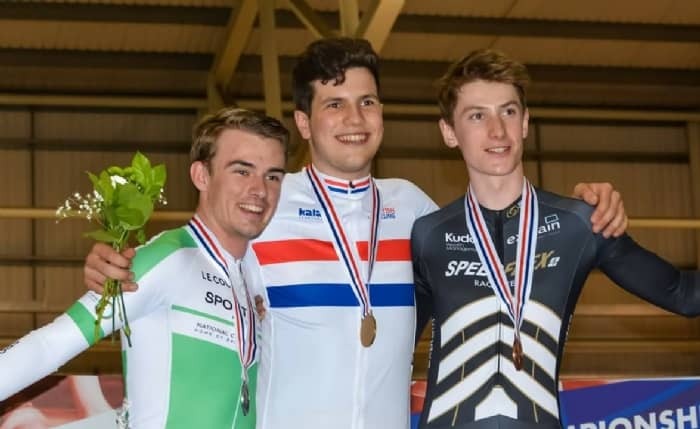 The Junior British Championships would be my last chance to win the infamous stripey jersey before I turned senior, when it would become a lot more difficult. So, I was more than determined to get my hands on one. 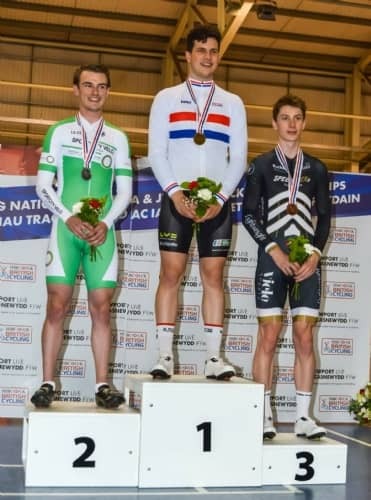 The event took place in Newport in Wales, I had only raced a couple times at the velodrome, but still knew it well. The events I was riding were sprint and keirin. The champs would be a good test to see where I was at a few weeks prior to the World Championships in Montichiari, Italy. The first race was keirin, this took place on the Wednesday. I was really excited for this as it was my best chance to win and my best event. I had a decent first heat and drew position four, two riders made it through. The bike pulled off and I waited patiently for a lap then I went around the group and led it put from the front. I went about 80% on the front to try conserve as much energy as possible for the final. I won the heat and had made it through to the final. There was a lot of time until the final so it gave me a chance to rest. After a long break, I was ready and prepped for the final. Once the bike pulled off I waited patiently at the front, Hamish Turnbull came from the back and took up the front. I sat onto Hamish’s wheel, having to fend off Arthur Taggart as he challenged me for his wheel. After a long fight I came out on top and the bell rang, it was one lap to go! I began to try pass Hamish but got boxed in by Chris Heaton. He passed Hamish with a half lap to go and I followed him round and just passed him before the line to take the win. Winning my first ever national title meant a huge deal to me. When I was younger and still to this day, I would look up to British Champions and now I was one! A couple days later I had another chance to win a national jersey in the sprint. The day began with the flying 200 qualifying. I posted a time of 10.79, this was quite a bit off my PB but, I was still recovering from the European Championships. The time qualified me 3rd, I had a slower qualifier in the 1\4 finals and managed to ride well and beat him 2-0 reserving some energy for the later rounds. In the semi-final, I was against a faster qualifier Caleb Hill. It was going to be close as only 1 hundred of a second separated us in qualifying. It was close racing but I managed to control the races well and beat him 2-0. 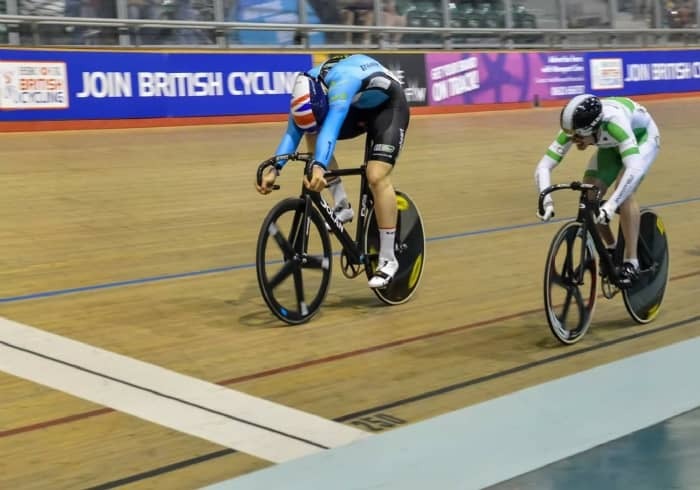 I had progressed to the gold medal ride-off against long-time rival Hamish Turnbull. He qualified a lot faster than me so it was unlikely I would win but I wanted to make it competitive. In the first heat, I rode a very good race and only lost the first race by half a wheel. In the second heat, again I rode a great race but didn’t quite have the speed and lost 2-0. I finished 2nd and I was very happy with that. It was a very successful week and I was so happy to finally win a British Championship gold. Normally I would thank either British Cycling or Scottish Cycling for taking me to the race and providing me with food and accommodation, but this time it was the turn of my parents. So, thanks a lot to my parents for the opportunity! My next blog will be the World Track Championships in late August. If you missed them, I have more blogs on the Braveheart Cycling Fund website! Make sure to read them!